2015 has been an exciting and busy year for Hunter Shea, who I am sure has to be part machine based on his crazy schedule! 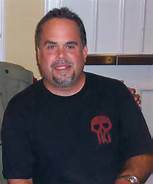 He has already released two great novels this year, the unique apocalyptic thriller Tortures of the Damned and the bone-chilling third novel of his Jessica Backman series Island of the Forbidden. 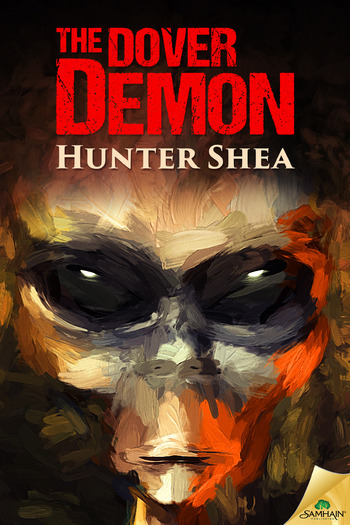 This time around, Hunter tackles another famous cryptid in The Dover Demon. Sam Brogna, now in his fifties, owns a comic store and is married to Lacy, a businesswoman who is constantly trying to get him to go back to the corporate world he left behind to spend more time with his son, Nicky. Their marriage seems average, but tensions simmer below the surface as she judges her success on his and is embarrassed of his new career. However, the store helped Sam forge a strong bond with his son based on their mutual love of comic books and by working together daily in the store. Sam is still best friend with Tank Clay, who ended up marrying his high school sweetheart Stephanie. Tank and Sam used to get into trouble together as teenagers, but now the extent of their troublemaking involves them sneaking biscuits and gravy at the comic store and fearing the tongue lashing they may get from their wives. Tank followed in Sam’s footsteps by leaving his job as a high-powered CEO to chase his dream of being an archaeologist. Despite Sam’s desire to move past his encounter with the Dover Demon, he sells copies of a book about the creature in his shop. Most of the townspeople hate the fact that outsiders flock to their town searching for the Dover Demon, but Sam almost seems proud that his comic book store is the one place in town that promotes the legend and harbors an interest in cryptids. His life seems to be perfect until a betrayal sends his life into a tailspin that causes him to run into his high school girlfriend Kelly Weathers. Kelly has tried to forget that fateful night back in the ’70s, but the experience has rattled her so badly she has started drinking heavily and developed a bit of an obsession with Dover Demon sightings. She is afraid of the creature and despite living in a constant state of paranoia, she is determined to uncover the truth about what her and her friends saw all those years ago. Sam’s son Nicky develops an interest in the Dover Demon and sets up a Google alert about the mysterious creature that lurks in the woods of Dover and that is when he stumbles across a new sighting, the first one in over 40 years. They were a series of blog posts from a man known only as Lando Solo, who Nicky recognizes as the man from his father’s comic shop that was asking questions about the Dover Demon a few days ago. The posts detail his trip to Dover and a sighting of the creature during a massive snowstorm a little after Thanksgiving. No one in town believes his story, so he turned to his blog in attempt to get the word out. The posts fascinate Nicky and inspire him, his best friend Roy and his sister Christine to go to the place of the sighting in an attempt to spot the Dover Demon for themselves. Kelly also stumbles upon Lando’s blog posts and it startles her. She has been investigating any story that seems like it could be connected to the thing her and her friends saw years ago and she begins to think there is a pattern, that the creature her and her friends encountered has been appearing more frequently. These are all just suspicions she has until she reviews her security cameras footage from the previous night. It is then she discovers someone or something has left footprints in a perfect circle around her home. It was as if something was dropped from the sky, walked around her home and then vanished into thin air. She is unable to determine what left the tracks, but when she watches the footage from inside her home, she makes a shocking discovery that will change the lives of her and her friends. I don’t want to diminish the thrill that comes with reading this scene for readers, but I will say that while I was writing my notes for this review, I tagged this page with the words “nightmare fuel”. It was a truly terrifying scene that stuck with me even after I finished The Dover Demon and will probably pop up in my nightmares for the next several months. Kelly shares her research with Sam, Tank and Stephanie in an attempt to warn them that the creature they saw back in 1977 may be coming back for them. They refuse to believe in Kelly’s theories until Nicky and Christine go missing after searching for the creature themselves. Fearing the worst, the four old friends set out to rescue Nicky and Christine and are plunged into a reality bending fight for survival. What initially scared me the most about reading this book was the Dover Demon’s resemblance to an alien. As a horror fan, I pride myself on not being scared of much, but the stories surrounding aliens and particularly this type, scares me more than just about anything. 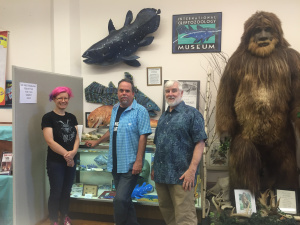 I grew up reading about cryptids of all forms and the story surrounding the Dover Demon stuck with me through the years based on the unusual facts that make it stand out from other sightings. The setting and atmosphere that Hunter creates in The Dover Demon is perfect and adds a creepy factor to the story. The small town setting and relative seclusion really helps lend itself to this story. I live in a small town and I couldn’t help but imagine this story taking place right in my back yard, which made it even more frightening. I really loved Hunter’s take on the Dover Demon as well. I picked up this novel expecting a straightforward alien novel, which would have been fine by me, but ended up being treated to something different and original. Hunter does make some allusions to the Dover Demon being an alien of some sort in the early chapters of the book, but as the story goes on, the truth behind what the Dover Demon is becomes a little bit murkier. I personally liked the ambiguity that surrounds the creature and thought Hunter did an excellent job of staying true to the events that inspired the novel while putting his own terrifying spin on it. Also as a fan of creepy, unexplained mysteries and stories, I loved the approach Hunter took with his characters. Often times with cryptid sightings or other unexplained phenomena, we hear the stories about the sighting and once the creature is gone or the phenomena is over, that is the last you hear about these people and the situations they have gone through. Hunter sets his story in the aftermath of the Dover Demon sightings which is an interesting style choice. We learn about the groups interactions with the Dover Demon through brief flashbacks interspersed throughout the story. I thought it was awesome that Hunter decided to dig explore the “what happens after” aspect of paranormal sightings. We learn about the characters immediate reactions to seeing the creature, but the most interesting parts of the story is seeing how that fleeting moment changed them forever. Each character handles the aftermath differently – Kelly spirals into paranoia and alcohol dependence, Tank pushes it from his memory but subtly searches for answers by becoming an archaeologist, Stephanie blocks it out completely and Sam handles it in a unique way that I don’t want to spoil for readers. Even when the Dover Demon returns after a nearly 40 year absence, the characters are still undergoing a process of moving on and understanding. They take their experiences from years ago and approach the situation from a different perspective. They are older and have seen this creature before, so they use what little knowledge they have from their personal experience to deal with the creatures. It is no secret that I love Hunter’s work and The Dover Demon is another excellent entry to his impressive collection of releases. The thing that I love most about Hunter’s books is his obvious love and passion for the subjects he writes about. If you read any of his interviews or watch his great podcast Monster Men with Jack Campisi, you will learn that Hunter is a huge fan of all things horror and the unexplained. As someone who shares similar interests, it is pretty cool to read a book that seems tailor-made for those who are fascinated with the unexplained. There were a few instances where I was confused after the group encounters the Dover Demon the second time around, but it didn’t significantly impact my enjoyment of the story. If you are a fan of cryptids, aliens or just enjoy a good story that will scare the hell out of you, be sure to squeeze The Dover Demon into your Halloween reading list! Be sure to scroll to the bottom of this post for your chance to win a signed copy of this awesome book! 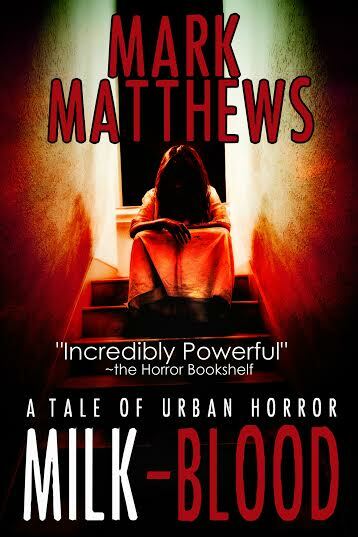 Mark Matthews’ “Milk-Blood” Optioned For Film! Monkey Knuckle Films is a newly created LLC, but the founders have a long history of horror, and have worked with actors such as Sid Haig from The Devil’s Rejects, and much of the cast of The Evil Dead. They are currently in post-production for the horror film, “Elder Island“, set for release in 2016. MILK-BLOOD was a semi-finalist for the 2015 Best Kindle Book Awards and is available in paperback, Kindle, or audiobook on Amazon. I praised the novel in my review and the balance of real-life horror and supernatural made this one of the most original horror novels I have read in years. I didn’t formally publish a “Best of” list last year, but if I did, Milk-Blood would have easily been near the top. I promise that I am not just saying that because Mark was kind enough to put my blurb on the cover, which has to rank as one of the coolest achievements in The Horror Bookshelf’s history. If you want to get a head start on the story, pick up a copy of The Damage Done, which is currently being offered as a free download on Amazon. You won’t be disappointed! Mark’s announcement also comes with a few other surprises for fans of his work. He revealed that a sequel to MILK-BLOOD is scheduled for release in early 2016. Here is what he had to say: “The sequel is some twisted material,” says Matthews, “but with a purpose. Horror without heart doesn’t appeal to me, and I don’t think to many readers.” In addition to the big news, Mark is offering up a free download of Milk-Blood to the first ten people to email him at WickedRunPress@gmail.com . No word yet on distribution for the film, but I will definitely be watching when the film is released! Be sure to stop by Mark’s blog for more information about his writing and check out some of his other great books on his Amazon page.